Mommy's Favorite Things: This Week We Had a #PampersEasyUps Party! This Week We Had a #PampersEasyUps Party! Get outstanding leak protection while potty training! Potty training makes sense with Pampers® Easy Ups® training pants! You and your little one will know when they're ready for potty training. Pampers Easy Ups Training Pants are designed for when your little one is ready for potty training during the day but still needs protection at night. Plus, they feature Pampers Leak Protection™ for up to 12 hours of protection, even overnight. And Pampers Easy Ups absorb quicker than the other leading training pant. And they feature fun Dora the Explorer® and Thomas the Tank Engine™ designs. Potty training is an exciting and eagerly anticipated milestone for toddlers and their parents. If your child is showing signs of readiness, spring and summer can be the ideal time to kick off potty training especially if your child is heading to preschool in the fall. Pampers® Easy Ups® training pants have fewer leaks than the other leading training pant to help simplify and improve the overall potty training experience. Pampers® Easy Ups® have an absorbent core that holds 25% more than the other leading training pant to help ensure little ones remain dry. Plus, with up to 12 hours of protection, it works during the day AND night, enabling toddlers and moms to confidently and completely transition from diapers towards underwear. 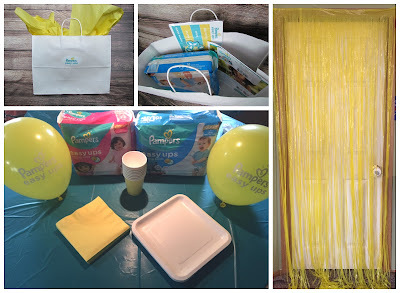 I was fortunate to receive some samples as well as some party decorations so we could have a fun house party for Pampers! Gift bags for attendees, featuring a pack of Pampers® Easy Ups® training pants, Potty Training chart with velcro pieces, potty training info and even a coupon! Potty Training Reward Chart is so fun. It is a monthly chart for going potty, wiping, washing hands and flushing. With super easy velcro pieces to easily keep track! So armed with gift bags and information sheets, it was time for our party! I used the enclosed decorations to set up for the party and get everything guest ready. We only had 1 mother and daughter show up, but we still had a lot of fun. I haven't seen her in about 4 years so it was nice to catch up with an old friend. The Pampers® Easy Ups® training pants come in sizes 2T-3T, 3T-4T and 4T-5T giving you plenty of options for the size of your child. 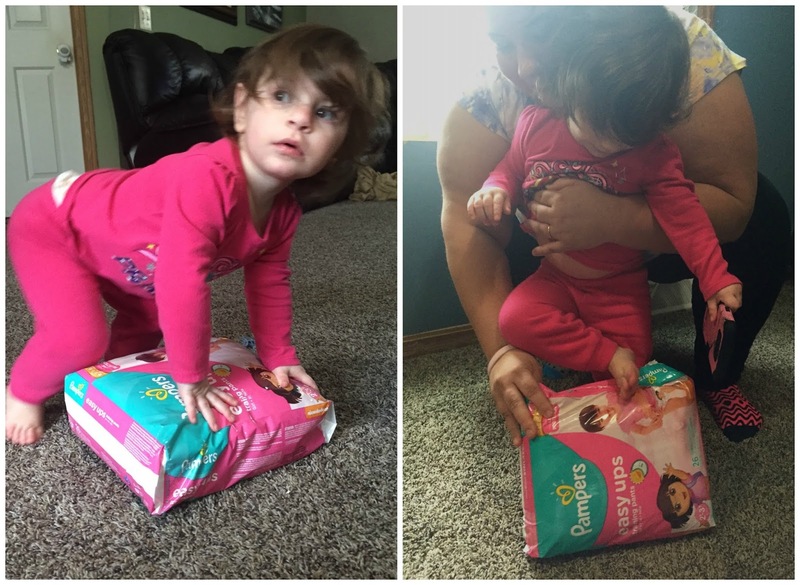 We have tried the Boys Pampers® Easy Ups® training pants with Liam, 2y 4m, and he's not really interested yet, but every couple weeks I see him making strides toward potty training, so we'll be there soon and I have lots of Pampers® Easy Ups® training pants ready to go when he is! One of my tips for potty training is to be positive about potty training. Let your child see you use the restroom, let them try and sit down in their clothes or not. Give them a chance to try and do this for a few months before you get serious about it. They get comfortable with the potty and hopefully learn what to use it for over time. Celebrate every win! Every time they go give them a reward, especially in the beginning. Even if that reward is as simple as clapping, jumping up and down and singing a little song! And you can always use my tip as well which is, let your child go naked for a couple days while they're learning to use the potty. This helps so they learn the feelings and cues and don't have to mess with pants. But always use your Pampers® Easy Ups® training pants for when leaving the house, or at night!